Extended loan for use by Ambassador Robert H. Pelletreau, U.S. Embassy residence, Cairo, Egypt, 1991-1994. Extended loan for use by Secretary Roderick R. Paige, U.S. Department of Education, Washington, D.C., 2001-2005. 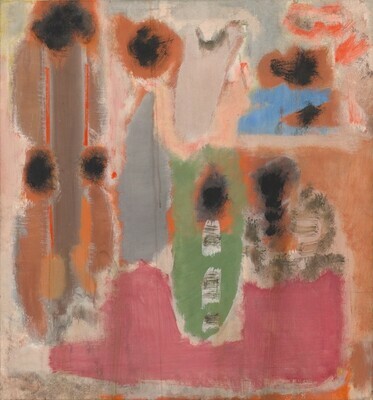 Mark Rothko: The Decisive Decade, 1940-1950, Columbia Museum of Art, South Carolina; Columbus Museum of Art, Ohio; Denver Art Museum; The Arkansas Arts Center, Little Rock, 2012-2014, no. 37, repro. American Paintings: An Illustrated Catalogue. National Gallery of Art, Washington, 1992: 312, repro. Anfam, David. Mark Rothko: The Works on Canvas: Catalogue Raisonné. New Haven and London, 1998: no. 357, repro. Langley, Allison, and Suzanne Quillen Lomax. "Mark Rothko's Multiforms, 1946-1950: Transforming the Painted Surface." Facture 2 (2015): 111-137, Table 1 no. 6.